Ruislip Woods National Nature Reserve is 'ancient semi natural woodland' and some parts are a remnant of the Wildwood that once completely covered England after the last ice age, about 8,000 years ago. When the land was first cleared for agriculture some woodland was left to provide timber and firewood. In the case of Ruislip Woods the native trees are oaks and hornbeams. Coppicing of hornbeams is known to have occurred for over five centuries up to the 1930's but it steadily reduced thereafter and ceased by the 1950's. Coppicing restarted in 1982 and, once more, the Woods are actively managed. Ruislip Woods now consists of Bayhurst Wood, Copse Wood, Mad Bess Wood, Park Wood, Poor's Field/Ruislip Common, the Ruislip Local Nature Reserve, The Northern Finger, Grub Ground, Tarleton's Lake and surrounding land in Hillingdon. Ruislip Woods National Nature Reserve, at 305 hectares or 755 acres, is the biggest single area of woodland in Greater London. Park Wood is one of the largest ancient woods in England in a completely semi natural state. The woodland is predominantly hornbeam Carpinus betulus coppice with oak standards and is interesting because of the occurrence of both pedunculate oak Quercus robur and sessile oak Quercus petraea. The mixture of hornbeam and beech Fagus sylvatica in Bayhurst Wood is also unusual and wild service trees Sorbus torminalis can be found throughout the woodland. Ruislip Woods have a great importance for nature conservation partly because of the unbroken historical link with the Wildwood but also because of their size. On a half day visit to Ruislip Woods experts attending a European Mycology Congress at Kew identified 585 species of fungus including four that had never been recorded previously in Britain. Ruislip Woods are the richest site in Greater London for lichens on trees. A bat survey carried out by volunteers over two years has shown that Ruislip Woods could well be the richest site in the region for these mammals about which surprisingly little is known. The Bat Group continues to watch and survey; we hope to publish their findings to all Friends of Ruislip Woods. Oak and hornbeam are the most numerous native trees in the Woods. Each year some areas of hornbeam are coppiced. This involves cutting down all the branches and main trunk and leaving a protruding stump (called the stool). After coppicing, new shoots grow from the stool and the tree effectively regenerates itself. Whereas uncoppiced hornbeams may live for seventy years or so, coppiced hornbeams have been known to live for five hundred years. About 2.5% of the Woods are coppiced each year in accordance with a plan which maps out the Woods. The coppicing is then carried out over a twenty year cycle and then re-started. This ensures that only about one half of the Woods will be coppiced, leaving many other interesting forms of woodland intact. Since 1982 Ruislip Woods have been actively managed. The purpose of this active management is to foster a greater diversity and richness of species and habitats and to maintain those habitats that make this area so interesting biologically. English Nature have studied the improvement in the variety and quality of those habitats and awarded Ruislip Woods the status of a National Nature Reserve (NNR) on 21st May 1997. Ruislip Woods was the first NNR in an urban area in England. As the area develops and diversifies it becomes more useful for educational purposes, both formal (schools and colleges), and informal (self-education and interest groups). Additionally as the public profile increases and it becomes a more interesting place to visit there is an increase in the number of visitors thereby putting the habitats under pressure. We need to provide guides, maps of interesting walks, and waymarking both to enhance the visitors' experience and to prevent this pressure from damaging the habitats. The NNR designation magnifies the necessity for these matters to be addressed. Click here to watch a video from 1997.It shows the declaration of London's First National Nature Reserve by Lord Cranbrook of English Nature and the longhorn cattle being released for grazing at Ruislip Common for the first time (for 50+years). 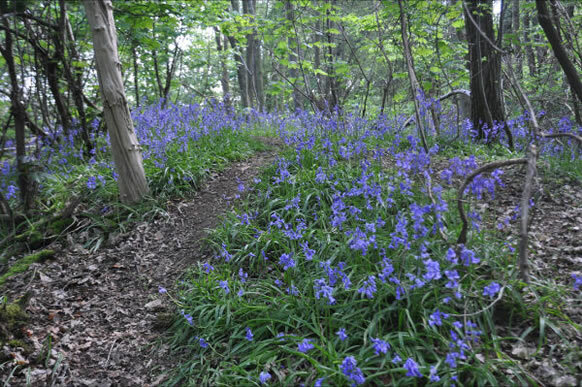 Bluebells in Bayhurst Wood photographed by Robert Wilson. The Long Term Management Plan is a 100 year vision for the woods and forms the backbone of all the decisions made about the management of the woods. It was adopted in 1982. Every 5 years a more detailed plan is written to cover the following 5 years. In the process of doing this the previous 5 year’s results are analysed and reported on to see how the strategies worked and what can be learnt for future planning. The resulting document is also an integral part of the Green Flag and Green Heritage Application which is an annual award. 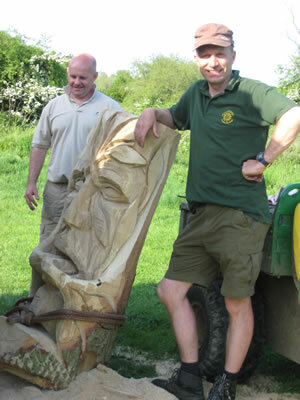 This work is undertaken by RWMAG ( Ruislip Woods Management Advisory Group). This is made up of representatives from the Residents Associations that adjoin the woods, the Council Green Spaces Team, The Ruislip Natural History Society, two local Councillors plus representatives from any of the user groups that use the woods such as the Hillingdon Equestrian Advisory Group and Hillingdon Athletics Club. For the purposes of writing the report a sub committee has been set up of the acknowledged experts in woodland management and the natural history of the site.